Location: About a mile south of the village, on south side of B3334 (old A38). Notes: At Chudleigh, the original proposal in the early 1860s was for the railway to cross the turnpike road on the level with a crossing adjacent to where the overbridge was eventually built. This was rejected by Parliament, and various alternative routes were then considered; this became known as the 'Chudleigh Deviation'. Routes either side were also rejected due to objections from landowners and the matter was left in abeyance until 1868 when a compromise was found that would satisfy all parties. The solution was an overbridge; initially this would have involved raising the approaches by 17ft but this was not acceptable and eventually, in 1872, Parliament finally agreed to an overbridge with the stipulation that the approaches must not be raised more than 7ft. After nine years of stalemate work was underway, but this 'final solution' would, in time, prove wholly unsatisfactory, as in order to leave sufficient clearance for trains passing under the bridge the track had to be lowered taking it below the level of the floodplain. 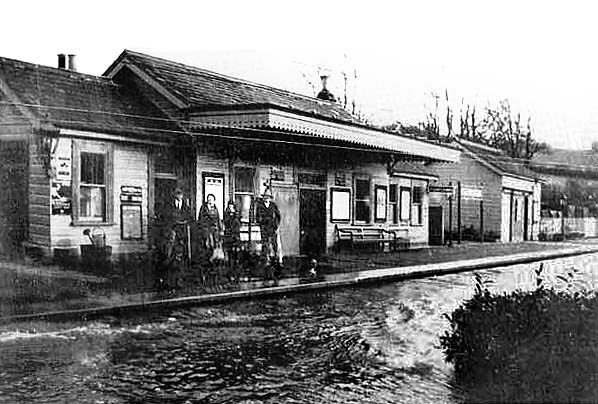 As a result, the station flooded almost every winter as the water level rose in the adjacent River Teign. This regular occurrence became so acute in the mid 1920s that a raised gangway from an adjacent lane was built leading to a special timber platform constructed on the north side of the A38 for use on such occasions. Passengers from Exeter would alight at this platform from where they would be taken to Heathfield by bus to continue their journey to Newton Abbott. It was still a further five years before work began at Chudleigh. Construction of the station and the laying of the track started in 1877 and work on the overbridge started the following year. The goods dock was completed in 1879 and the steps down the embankment from the road and the parcels store were completed in 1881. The following year, the sidings were laid and the signal box was completed. After five years under construction the station finally opened on 9 October 1882. At this time the line ran only as far as Ashton, a distance of 6¼ miles from Heathfield. Chudleigh was the first intermediate station at a distance of two miles from Heathfield. Chudleigh station was a mile south of the town with a large forecourt alongside the B3193 leading to Kingsteignton. It had a single platform 160ft in length on the east side of the line, faced in granite and edged with concrete slabs. The main station building was of timber below a pitched grey slate roof and almost identical to that at Heathfield; it had a canopy with a deep valance stretching part way across the platform and a wing at either end and a small entrance porch. It was faced with horizontal weatherboarding painted sand and buff. The two end-wings contained the gents' toilet and a store/parcel room. A few yards to the south along the platform, there was a timber parcels lockup. This had a sliding door on the platform and another door with a porch at the rear to transfer goods to and from road vehicles. There was a station nameboard sandwiched between the station building and the lock-up. Chudleigh was the only station on the Teign Valley line to operate a parcel collection and delivery service in the town. The small goods yard comprised a long loop to the south of the station on the east side from which a short siding ran into a 100ft-long dock behind the platform. The station did not handle livestock apart from horse boxes, and the siding usually contained coal wagons. There was a 3-ton capacity crane. Access to the yard was controlled by the timber-clad signal box with a 13-lever frame opposite the north end of the loop on the west side of the line. The box closed in 1910 and was replaced with two 2-lever ground frames. In 1940 the top part of the box was removed and the bottom part was roofed over and used as a permanent way mess hut. 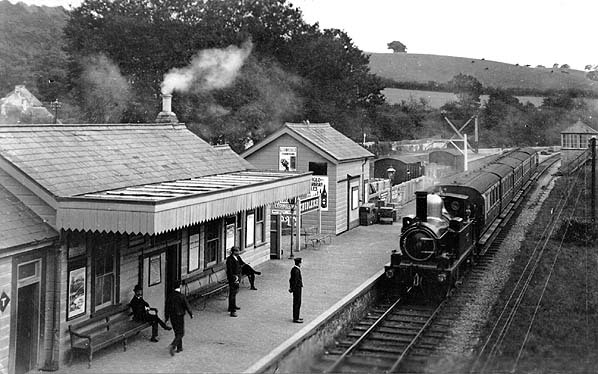 The people of Chudleigh had waited a long time for their station and it was immediately well used with almost 1,000 tickets being sold during the first week. Passenger receipts continued to rise each year reaching a peak in 1913 when 19,895 tickets were sold. 1913 was also the peak for goods traffic with 11,488 tons handled, 95% being inward traffic. Following WW1, when the railways were taken into Government control, passenger numbers began to decline following the new Devon General motor-bus service that had been introduced between Exeter and Newton Abbot via Chudleigh. The initial train service to Ashton consisted of five in each direction. When the line was finally extended to Exeter on 1 July 1903, six trains operated in each direction. In 1924 this was increased to seven but in 1939 it was reduced to four as a wartime economy measure. By 1943 freight tonnage had halved from its 1913 high with 6,120 tons being handled. In 1946 the passenger service was increased to five and remained at this number until closure of the line. A camping coach was introduced in 1939 but was removed during the war; returning between 1956 and 1958. After the passenger service was withdrawn in 1958 the station building was boarded up and the canopy was removed. One man was retained to supervise freight and parcel traffic. 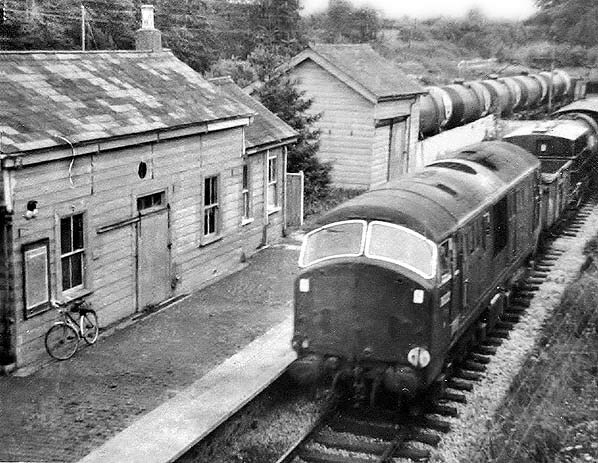 The general freight service was withdrawn on 14 June 1965; after this date the station was classed as a coal depot with coal and oil for the gasworks at Oldway being unloaded there until 4 December 1967. 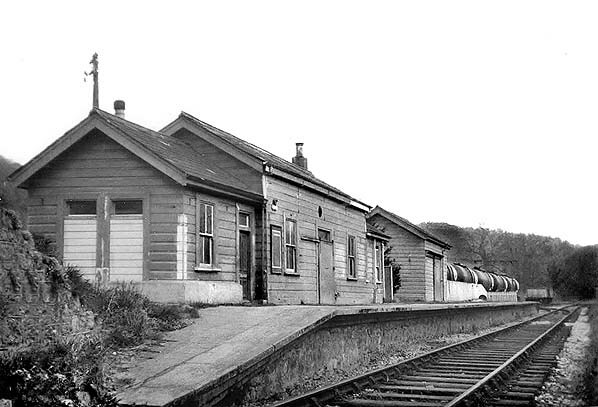 The station was demolished in early 1970 during the construction of the Chudleigh bypass which opened on 21 June 1973. The B3334 was widened at this time, and it had a junction with the new bypass immediately east of the station site. The original bridge over the railway was retained, now sandwiched in the middle of a much wider bridge over the trackbed. The station site also still exists. The trackbed can be followed north from Chudleigh Knighton to Chudleigh station although it is not an official footpath. The station site has now been bisected by a widened Kate Brook, a small tributary of the River Teign. Its confluence with the river was moved north close to the overbridge during the construction of the bypass. Chudleigh station looking south from the overbridge c1905: a popular and regular vantage point for photographers over the years. An Exeter train is seen arriving. The two end-wings of the station buildings are seen with the parcels room closer to the bridge and the gents' toilet at the far end. Two coal wagons and two vans are seen standing in the siding to the rear of the platform. A crane is on the goods dock. Chudleigh signal box is on the right; this would close at the end of the decade. 1888 1:10,560 (6") OS map. 1905 1:2,500 (25") OS map shows Chudleigh station sandwiched between the River Teign and the Kingsteignton Road. The station building and parcels lock-up are seen on the platform with the goods dock to the rear. The goods dock is shown as a line alongside the siding with a crane sitting on the dock. In 1914/15 the parish council approached GWR with a proposal to extend the siding to cater for the increase in road stone traffic. The GWR supported the proposal but the Teign Valley board opposed it and the siding was never extended. The signal box is shown opposite the dock. The semi-circle opposite the platform is the station garden. 1956 1:2,500 (25") OS shows the long loop siding to the south of the station. The signal box is still shown but not identified as such. By this date the truncated building had been converted into a permanent way mess room. Note the ramp alongside the track to the north of the station. This was installed in the mid 1920s to allow passengers from Exeter to reach a short wooden platform when the station was flooded. Chudleigh station looking south from the overbridge in 1921, A large number of assorted wagons are seen in the siding. Some of these are for coal, whilst others are for road stone which is seen piled up at the south end of the goods yard. 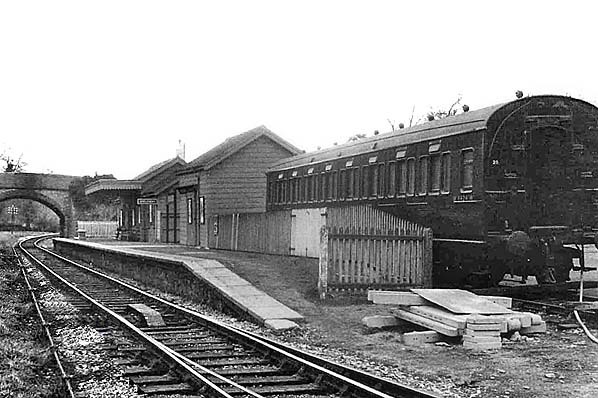 The signal box, seen on the right, was out of use by this time, having been replaced by two ground frames. Note the brick platform surface. The GWR encouraged the establishment of a formal garden opposite the platform and such a garden is seen here surrounded by a low hedge. At this time it is just grass but photographs from the 1930s show an attractive ornamental garden. The station staff also worked an allotment alongside the line to the north of the road bridge. Because Chudleigh station had to be built below the level of the flood plain - following protracted objections from local landowners during the parliamentary stages- it was flooded during most winters as the water level in the adjacent River Teign rose. The water level was particularly high in 1929, as seen here. To allow trains from Exeter to reach Chudleigh in times of flood, a temporary wooden platform was built to the north of the station in the 1920s. 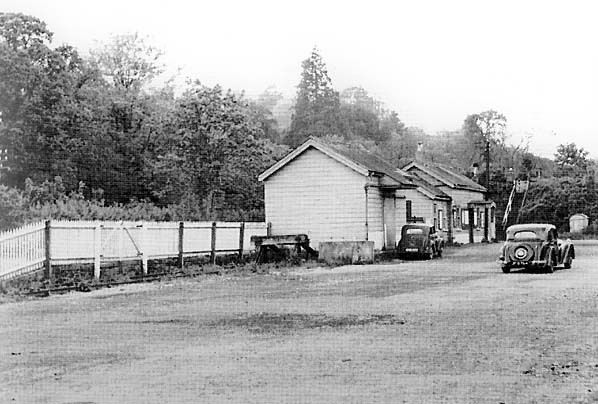 The wide station forecourt at Chudleigh station in the 1940s. Note the siding terminating close to the parcels shed behind the platform. A camping coach had been placed here in 1939 but it was removed when the railways came under Government control during WW2. Note the stairway down the embankment adjacent to the bridge and the neat four-foot-high fencing at the rear of the platform. 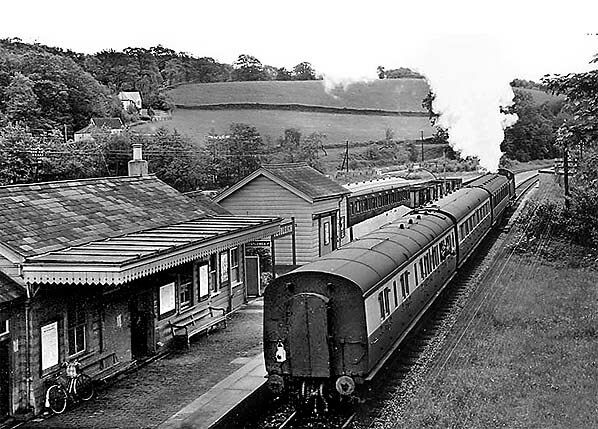 Chudleigh station looking north in March 1956 shortly after the camping coach was reinstated; it would remain in the siding for three seasons. In its last few years the station is looking very dilapidated and in need of a coat of paint. 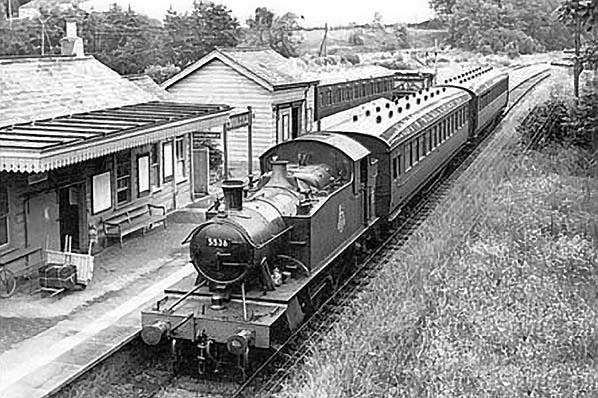 A Newton Abbott train is seen at Chudleigh station in June 1958, its last year as a public station. The camping coach is seen in the sidings along with three coal wagons. These probably supplied coal to Taverners, the largest coal merchant in Chudleigh. The truncated signal box is seen on the right, now converted into a permanent way mess room. The yard crane, seen in earlier pictures above, has been removed from the dock. 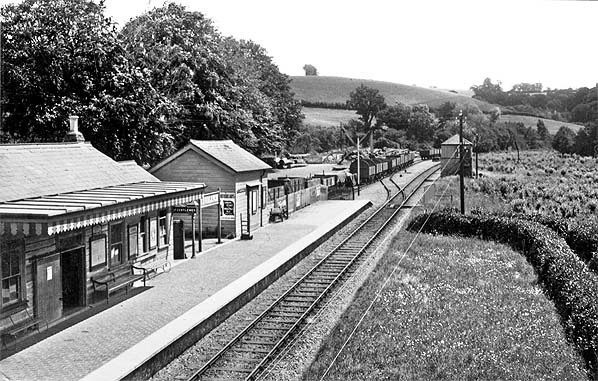 Chudleigh station looking south c1961. The station is now closed; the canopy and the clock below it have been removed as has the camping coach. The station is still open for goods traffic Gas oil tanks for the gas works at Oldway are seen in the siding. A mixed goods train is seen at Chudleigh station c1961. At this time the station still handled a full range of goods traffic but with only three trains a week on Tuesdays, Thursdays and Saturdays. Within a few years all goods traffic ceased north of Chudleigh. All general freight services were withdrawn from 4 June 1965 leaving only coal and oil. One railwayman was still employed at the station; his bicycle is seen leaning against the wall.